Happy to announce my new blog site! Although I love blogger.com, it does not provide all the features I'd like to have in my blog page. Therewore I created my new blog site, where I transferred all blog posts from this blog. You may visit my new blog site at http://itblog.inginea.eu/. I will be posting there from now on. In fact, there is already a new post about using Facelets in the new MVC framework in the coming Java EE 8 framework. JPA provides essentially 2 types of locking mechanisms to help synchronize access to entities. Both mechanisms prevent a scenario, where 2 transactions overwrite data of each other without knowing it. As a result, changes done by Adam are completely gone and overwritten by Barbara without her even noticing. A scenario like this is sometimes called dirty-read. Obviously, a desired result is that Adam writes XA, and Barbara is forced to review XA changes before writing XB. Optimistic locking is based on assumption that conflicts are very rare, and if they happen, throwing an error is acceptable and more convenient than preventing them. One of the transactions is allowed to finish correctly, but any other is rolled back with an exception and must be re-executed or discarded. As you see, Barbara is forced to review Adam's changes, and if she decides, she may modify Adam's changes and save them (merge the changes). Final data contains both Adam's and Barbara's changes. Optimistic locking is fully controlled by JPA. It requires additional version column in DB tables. It is completely independent of underlying DB engine used to store relational data. For some, pessimistic locking is considered very natural. When transaction needs to modify an entity, which could be modified in parallel by another transaction, transaction issues a command to lock the entity. All locks are retained until the end of transaction and they are automatically released afterwards. As we can see, Barbara is again forced to write XAB, which also contains changes by Adam. However, the solution is completely different from optimistic scenario – Barbara needs to wait for Adam’s transaction to finish before even reading the data. Furthermore, we need to issue a lock command manually within both transactions for the scenario to work. (As we are not sure which transaction will be served first, Adam’s or Barbara’s, both transactions need to lock data before modifying it) Optimistic locking requires more setup than pessimistic locking, with version column needed for every entity, but then we do no need to remember issuing locks in the transactions. JPA does all the checks automatically, we only need to handle possible exceptions. Pessimistic locking uses locking mechanism provided by underlying database to lock existing records in tables. JPA needs to know how to trigger these locks and some databases do not support completely. where LockModeType.PESSIMISTIC_READ was requested, but not vice versa. This is really the default. It is usually ignored as stated by ObjectDB. In my opinion it only exists so that you may compute lock mode dynamically and pass it further even if the lock would be OPTIMISTIC in the end. Not very probable usecase though, but it is always good API design to provide an option to reference even the default value. This is a rarely used option. But it could be reasonable, if you want to lock referencing this entity by another entity. In other words you want to lock working with an entity even if it is not modified, but other entities may be modified in relation to this entity. We have entity Book and Shelf. It is possible to add Book to Shelf, but book does not have any reference to its shelf. It is reasonable to lock the action of moving a book to a shelf, so that a book does not end up in 2 shelves. To lock this action, it is not sufficient to lock current book shelf entity, as the book does not have to be on a shelf yet. It also does not make sense to lock all target bookshelves, as they would be probably different in different transactions. The only thing that makes sense is to lock the book entity itself, even if in our case it does not get changed (it does not hold reference to its bookshelf). this mode is similar to LockModeType.PESSIMISTIC_WRITE, but different in one thing: until write lock is in place on the same entity by some transaction, it should not block reading the entity. It also allows other transactions to lock using LockModeType.PESSIMISTIC_READ. The differences between WRITE and READ locks are well explained here (ObjectDB) and here (OpenJPA). However, very often, this behaves as LockModeType.PESSIMISTIC_WRITE, as the specification allows it and many providers do not implement it separately. this is a stronger version of LockModeType.PESSIMISTIC_READ. When WRITE lock is in place, JPA with the help of the database will prevent any other transaction to read the entity, not only to write as with READ lock. in step 4, if version column is not incremented by transaction B, nothing prevents A from overwriting changes of B. Lock mode LockModeType.PESSIMISTIC_FORCE_INCREMENT will force transaction B to update version number and causing transaction A to fail with OptimisticLockException, even though B was using pessimistic locking. You may use any of the two types of lock mechanisms in JPA. It is also possible to mix them if necessary, if you use pessimistic lock of type PESSIMISTIC_FORCE_INCREMENT. To learn more, read this excelent blog of Vlad Mihalcea. Anybody likes reading com.superframework.core.base.Object object = new com.superframework.core.base.Object() in the code? I wonder how many times I have asked myself why Java is so complicated to read and write? Why I have to keep writing so many characters and lines of code to express a simple repetitive task? It's appeared to me like Java language designers keep torturing developers by forcing us to use constructs invented 15+ years ago without an alternative. But this one is simply an outrage. Considering that e.g. Python is even older language than Java and you never have to write complicated namespaces in the code more than once in the import. On the contrary, Java does not provide a simple and readable solution when two classes of the same name have to be used in one source file. No commentary needed, everybody can surely see the difference. Although, you can see the horrible Java code above mostly in generated code, sometimes it is not easy to avoid name clashes, which lead to Java code one would puke from. In this particular example, imported Object can be even easily confused with standard java.lang.Object. In Python, you may name it as you wish to avoid name clashes. I understand that 15 years ago adding syntactic sugar to the language was not a top priority. But nowadays, if Java aims to stay the language of choice for millions of developers, it is necessary to consider small improvements like this, which have drastic impact on quality of the code and developers' work. After having the pleasure building my code around CDI for couple of years, it feels very natural to use it to structure my code according to well-known patterns. CDI is a dependency injection mechanism designed to be used within Java EE application servers, and this could be perceived as a disadvantage. However, I want to show that it can be used and has great potential also in a Java SE application. What is great about CDI is that it is much more than an injection mechanism. On top of this it provides also an elegant and powerful event passing mechanism. This feature can be nicely combined with Swing to build a GUI application based on MVC pattern. In the method above, you may initialize your application, build and display the GUI and wait for Swing events. Here we need to remember that observers of CDI events would be created as new objects for any event triggered, together with all dependencies. I used @ApplicationScoped for MainFrame to ensure that all the code operates on the very same instance of it. One thing to mention here: in order for CDI to work, instance of MainFrame must be created by CDI, and not using its constructor directly. This is achieved by injecting it to already existing bean - e.g. the one, which observes ContainerInitialized event emitted at start-up. Finally, the controller updates the model and triggers update of the view if necessary. If we take it further, we may trigger an update event from the controller, which would be observed by the view, in this case the MainFrame component. Or even build a model, which automatically triggers CDI events on update. 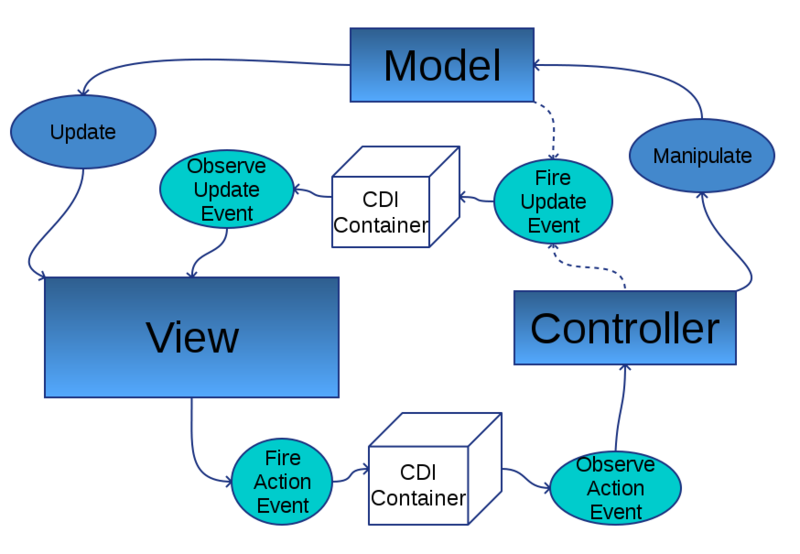 Thus, controller and view would be completely decoupled and only respond to events - GUI events flowing in the direction from View to Controller, and data-update events flowing from Controller/Model to View. In summary, CDI event mechanism is very convenient for building an MVC Swing application with View decoupled from business logic. This can be accomplished by running your application inside the Weld CDI container (1 line of code), triggering actions from Swing listeners (2 lines of code) and observing the actions (single method on any CDI-enabled class). The actions take a form of a data bean, which itself is not too many lines of code altogether. Application servers and environments supported by Weld. Two things to highlight here: a fully functional 3D printer is as cheap as 600€, and "What may fail will fail" - at least until you learn how to use it properly. To let the fun continue, I switched then to the latest and greatest trends. Microservices, here I come! The idea to cut a huge system into small and focused microservices is easy to grasp. Knowing when such architecture really helps and how to design it properly is still dark waters for me. Speakers from a company based in Ostrava came to present their approach and experiences. Well, big European mobile operators under the pressure of the market tend to provide constant flow of change requests. To meet their requirements, microservices architecture seems to be a perfect match . Such systems can be maintained in distributed manner, components redeployed separately in different time-frames, failures don't pull the whole system down. Obvious drawback - transactions are hard to manage across multiple services. But as Neal pointed out, maintaining transactions can be really slow and inefficient. 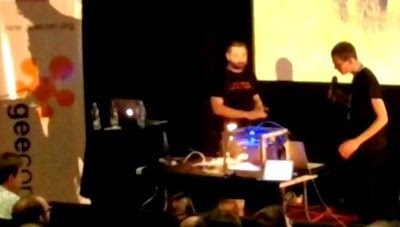 Designing operations as idempotent might come to the rescue - how many times have you checked an already locked door just to be sure? Certainly many times and it didn't cost much. Simple rule noted down: always unregister classes you publish to anything on the app server's classpath. For the rest, almighty restart might be cheaper than the time spent on seeking leaks. No more time to mention Erlang, Go, Rust, Scala, Kotlin nor Java 8. Luckily Bruce Eckel had a wonderful closing speech about all of them. Even more, he mentioned the driving forces that lead people to design new languages. Better support for parallelism, readability, even purity in design are among them. But purism proved not to be very helpful and mostly did not work. Software transactional memory has not grown to be really usable concept as well. On the other hand, inherent support of parallelism becomes a valuable selling point of modern languages, like Erlang. Even Java 8 has now support for parallel streams. Though, Java 8 stays way too boring. Maybe "Thinking in Kotlin" will be the next book by Bruce Eckel? Anyway, after all that hassle, Python stays Bruce's favourite language - no wonder, more than 20% women in the active community are and will stay another great selling point. Applause to Mr. Eckel for his insights and thank you for reading!